What does a food obsessive as far gone as me want for Christmas? Only a Bradley smoker. Thanks Mum and Dad! This has been at the top of my most-wanted list for some time now. I’m the happy owner of a stovetop smoker (favourite trick: smoked potatoes for mash), but have been frustrated by the inability to cold smoke food. The Bradley solves that, and opens a whole world of new food possibilities. It’s a cabinet the size of a small fridge with a separate smoke generation device. This is bolted to the side, or optionally can be moved away from the cabinet, resulting in cooler smoke. It burns bespoke puck-shaped “bisquettes” also made by Bradley, which come in a variety of flavours including oak, apple, maple and cherry. Each bisquette burns for 20 minutes before being dumped into a bowl of cold water to extinquish it. The Bradley is an outdoor unit and I have a perfect space for it near our shed, sheltered from the elements. As far as I can see, you could cold-smoke most things. The obvious beneficiaries are oily fish like salmon, trout and eel. I plan to smoke pretty much anything that might benefit; scallops, chicken (Momofuku cold-smoke wings before turning them into fried chicken), ham, bacon, cheddar, duck, game, joints of beef, lamb. Even a homemade curry will benefit from a bit of smoke (according to Lasan’s freely-available cookbook). The Bradley has an inbuilt heating element if you want to warm or hot-smoke also, so you could roast a leg of lamb and smoke it at the same time! I can’t think of many things that wouldn’t be improved by those flavours! After seasoning the smoker, I got started on my first smoking experiment. I had frozen a 1.5kg piece of Jack O’Shea’s Irish ribeye on the bone, just waiting for the right moment. This was it. A piece of meat this special needs some extra special treatment, so what better than to try and add some oak smoke to it? I salted the joint and let it come to room temperature. An hour of warm smoking at 60 degrees centigrade did not appreciably cook the joint but gave it a pungent bonfire smell. I then subjected it to a hot charcoal barbecue, resulting in a lovely dark crust. I love to use the barbecue like this to get a lovely charred crust, but you can’t cook it this way, you have to then move it to the oven to cook the inside. 20 minutes in a hot oven and it was done rare; about 50 degrees centigrade. Another 20 minutes to rest and it was ready to eat with some mashed potatoes and creamed spinach. 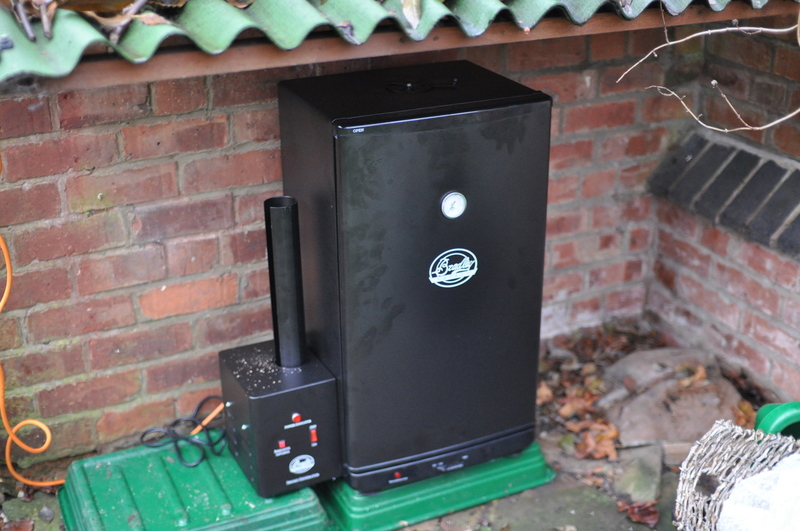 The smoking was subtle, but appreciable, and added a bit of definite extra umami bacon flavour. A legendary steak dinner. The great Mark Hix smokes his own salmon in his garden using a Bradley and supplies the results to his restaurants as well as Selfridges. 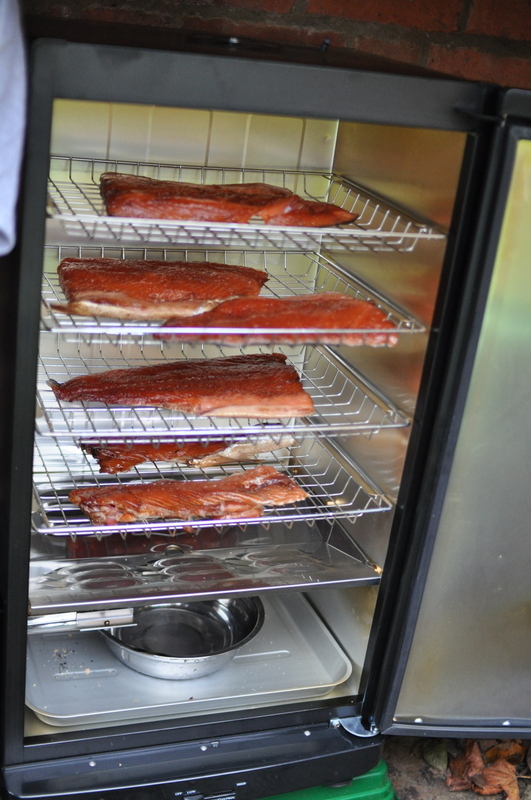 Being a big fan, I thought I would start my salmon smoking experiments by ripping off his “Hix Cure“. I managed to source a whole organic Loch Duart farmed salmon weighing 3.5kg from my local Loch Fyne restaurant at short notice (thanks guys!). This came whole, but already gutted and scaled. Once filleted (rather amateurishly, I’m afraid), a simple salt and sugar cure was applied – 500g of molasses sugar and 160g of Maldon salt. This cured for around 16 hours in the fridge. The next day I drained the liquid that had accumulated, washed the cure off and made some slashes in the skin so that the smoke would permeate the fillets better. I popped in 12 oak bisquettes and left the salmon to its devices while we went to the Jewellery Quarter and looked around the great Birmingham Pen Museum. When I came back the cabinet temperature was at an alarming 50 degrees C despite the heating element being off. I was initially worried I might have accidentally cooked the fish, but although the fat had been drawn towards the surface, this settled after refrigeration. The end result was excellent. The smokiness is intense. The slightest handling of the pieces gives you fingers like a 50-a-day man. The molasses cure lent it a full-bodied sweetness but it was not overwhelmingly “treacle-y”. This really was nothing like supermarket smoked salmon. We enjoyed some on its own, and then on blinis with cream cheese. For New Year’s Eve dinner, I made the following concoction. The idea for this salad is stolen from Fergus Henderson’s second book Beyond Nose To Tail (not quite as good as his first effort, IMO) where grated beetroot is teamed with finely sliced red cabbage and red onion. This is combined with an oil, balsamic vinegar and caper dressing. 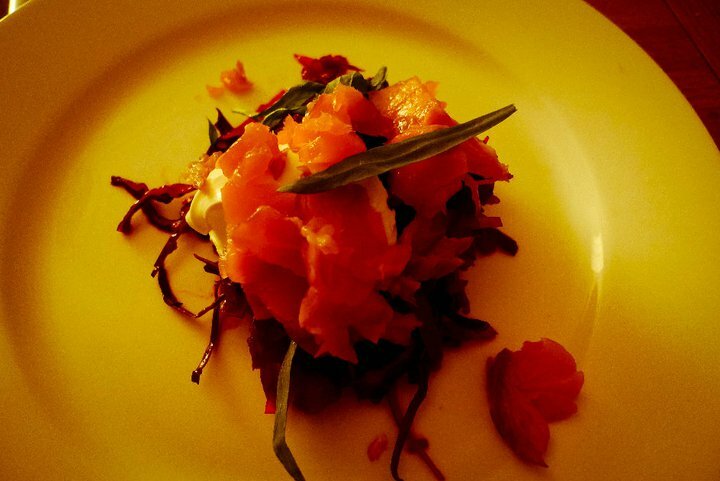 On the plate a decent nudjule of creme fraiche is spooned on top and sprigs of chervil are draped over it. I substituted tarragon for chervil, and sherry vinegar for balsamic (I hate balsamic vinegar!). 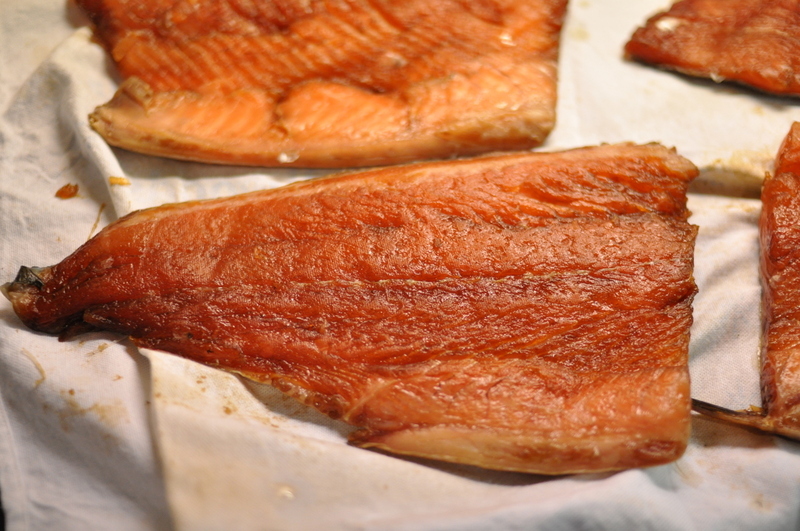 The major innovation was to place a few choice slices of smoked salmon on top. As Fergus suggests, the ingredients like to be messed up on the plate. For New Year’s Day breakfast I made sourdough muffins according to Tom Baker’s recipe. Despite my hangover (or because of it), kneading the wet dough mixture was less stressful than usual. Later I will try making some smoked salmon fish cakes from the fatty offcuts, with a very garlicky mayonnaise. What next? Not sure, I’ll let you know!